This production tours with a cast of 45, orchestra of 13 and a technical team of 49 who bring the show to life eight times a week. It takes 18 45-foot trailers to move the production from one venue to the next. The show finishes in one venue on the Saturday and opens in the next venue on the Wednesday, just 4 days later. Over 100 people are involved in transferring the show and the team work around the clock to make it possible. • The backstage teams includes: 1 Company Manager, 7 Stage Management, 6 Stage Crew, 4 Flymen, 3 Followspot Operators, 3 Touring Carpenter, 3 Automation Operator, 3 Sound Operators, 3 Touring Electricians, 7 Dressers, 4 Wigs personnel and 5 Wardrobe personnel. • There are 12 Members of the Orchestra plus a Musical Director. • The creative team includes: 1 Associate Director and 1 Children’s Director. • Requires 18 x 45 foot trailers. • 58 Motors are used to suspend the set and equipment in addition to the theatres flying bars. • The flown nursery scenery weighs nearly two tons. • There are 25 flying elements in the set. • Do 64 loads of washing per week. • Spend each day darning stockings, and each member of the wardrobe team has their own darning mushroom. • Every piece of costume has a hand sewn label with the actors name, scene and character. • The majority of the costumes are kept onstage in a large area known as the Quick Change Village. • Each Swing (cover cast member) has 19 sets of costumes, shoes and hats. • Every child’s costume is checked by a member of wardrobe before they go onstage – to check that they still fit and look correct. • All the costumes are washed on a regular basis – they then have to be sprayed and painted to make them look dirty. • 3 washing machines, 4 tumble driers, 3 ironing boards and 3 steam generator irons tour with the production. • Wardrobe will drink over 4000 cups of tea during the tour! • There are 90 wigs in total including the understudy wigs. • The make-up department goes through 20 packets of baby wipes in a week to remove all the dirt off the children and adults. • There are 97 moving lights, and 3 followspots used in every show. • There is 1 smoke machine, 2 haze machines and 2 foggers. • The electrical equipment takes 2 x 45 foot trailers to transport between venues. • The Stage Management team is made up of 1 x Stage Manager, 1 x Deputy Stage Manager and 5 x Assistant Stage Managers. • Approximately 800 ice packs will be used throughout a year to help control muscle injuries to the cast. • 95 mics are used per show. • 140 loudspeakers are used per show. • 20 video monitors are used per show. • 32 wireless communications devices are used per show. 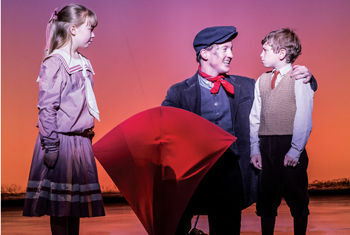 The stage production of MARY POPPINS originally opened in 2004 and ran in the West End for three years and over 1,250 performances. During this time it won the Olivier Award for Best Theatre Choreography and Best Set Design as well as the Evening Standard Award for Best Set Design and the Variety Club Award for Best Musical. The Broadway production ran for over six years where it won the Tony Award for Best Set Design. The show has subsequently played to great success in Holland and Mexico. It has toured Australia, New Zealand, the U.S, the UK, has been seen by over 11 million people and is currently breaking box office records in Vienna.